How can I say this? Okay, sorry Audi, I’m a Mercedes man. I’m more at home in a Mercedes E Class or S Class than any other car. 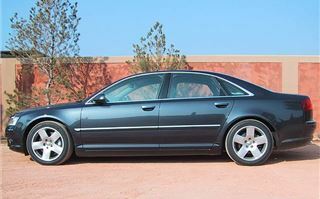 I was especially at home in the LHD only Mercedes S500 4-Matic. 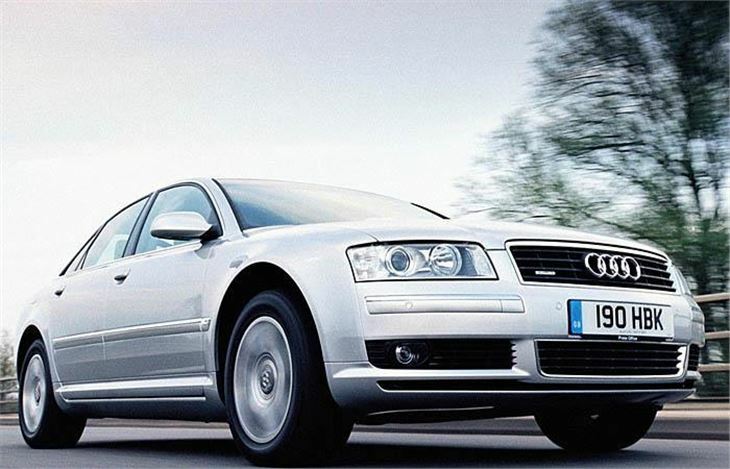 So the new Audi A8 Quattro was in trouble from the start. And then, just to compound the misery, we got landed with a duff car. The choice was 4.2 or 3.7, so naturally we plumped for the 4.2, loaded our luggage and headed out into the countryside. Brief note to Mercedes here, the boot of the Audi A8 holds a LOT of luggage. It appears to be about 50% bigger then the S Class rear compartment. So we got moving down the first straight. The new A8 has a 6-speed Tiptronic torque converter gearbox with DSC, or “Dynamic Shift Control” in Audi parlance. 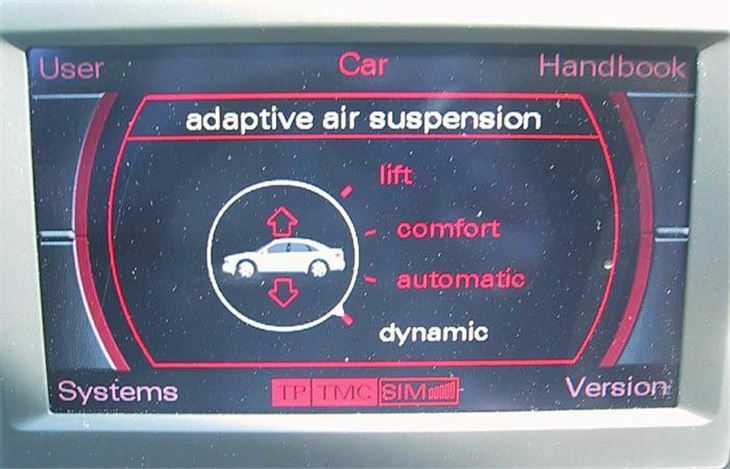 This allows you to make manual downshifts or upshifts using a pair of steering wheel paddles whether you’re in full Tiptronic mode, Drive, or Sport. Sport has the advantage of holding the gear you use to enter a bend all the way round, so you don’t get an annoying downshift that unsettles the car on the apex. 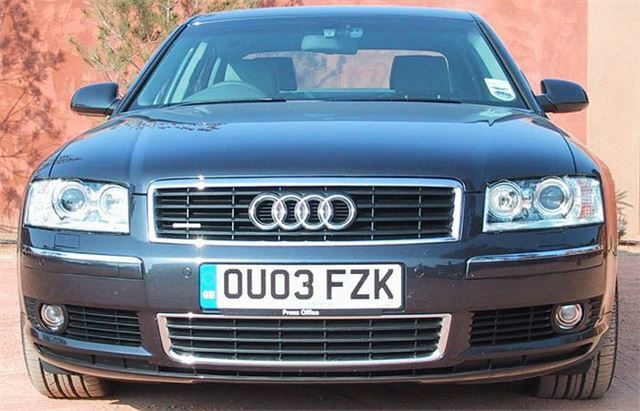 Anyway, pretty soon the speedometer was registering 100 and, since this was a RHD UK spec A8 (though not in the UK), that was miles per hour, not kilometres per hour. The engine makes a lovely V8 howl as it hits higher revs and you gather speed very rapidly. All that was fine. 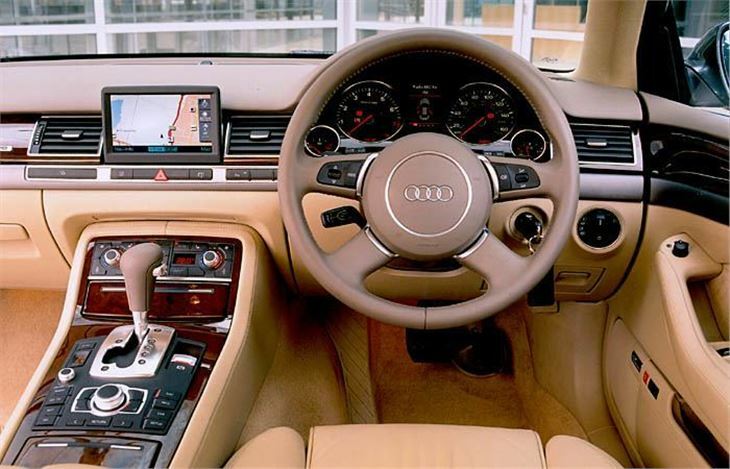 And so was the intuitive MMI (“Multi Media Interface”) control centre that makes BMW’s 7-Series I –Drive look like a colossal mistake that could drive buyers away from 7s and into A8s. But then we reached the twisty bits and it didn’t seem to matter what suspension setting I chose, I got howling tyres and understeer on almost every corner. In direct contrast to the S Class 4-Matic I just could not trust the front not to move a few feet from where I wanted it to be. And I’m not even talking extremes here. The roads we were using were admittedly very demanding, with bend following bend swooping up and down all over the place. And it was very difficult to keep the car on line. “Well slow down, then,” I hear you say, and, of course you’re right. But the new A8 is supposed to be a World-beater. What’s the point of an amazingly rigid body structure and an extremely sophisticated four-wheel drive system if the car washes out all over the road? Okay, sure, with an understeery car you can take it by the scruff of its neck and force it to handle. Even an old Vectra will if you turn-in exceptionally early. But you shouldn’t have to. It wasn’t until discussions over dinner that I spoke to a well respected driver whose opinion of the car was the absolute opposite. It turned out he’d been driving the 4.2 Sport, which rides 20% lower, has 20% stiffer suspension and sits on bigger, 19” wheels and tyres. So next day we tried that one, and it was chalk and cheese. The 4.2 Sport was fantastic. Easily the equal of my favourite S500 4-Matic, which you can’t buy with RHD anyway. And probably better. It had started raining by then after a long dry spell, so the conditions I tried it in were ideal for comparison with my wet drive through the Black Forest in the Merc. The A8 4.2 Sport is a serious piece of kit. It turns into wet corners confidently. If the corner turns out to be tighter than you anticipated, you can make a Mercedes-like adjustment half way round without upsetting the applecart. Even if you get it silly wrong and lose traction to all four wheels, it’s easy to pull back under control without turning your little drama into a crisis. And on a decent straight that V8 engine yowls it up to 120 very quickly indeed. Top speed is artificially limited to 155 and without the limiter you could expect 165 – 170, if you were a very bad boy. 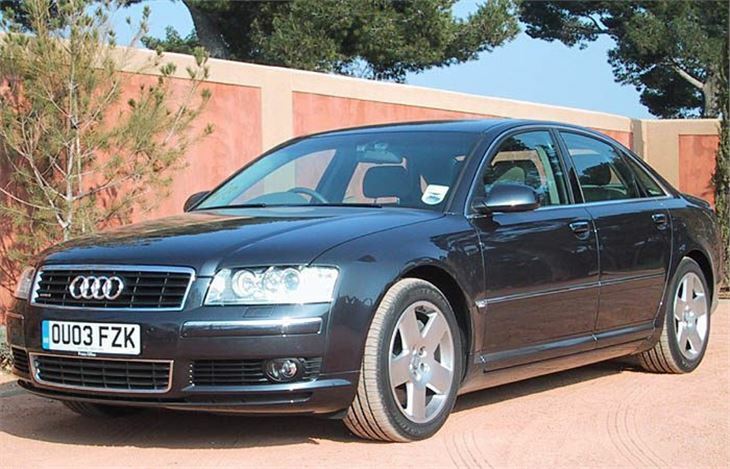 Okay, but this is a limo (even the standard car had bags of rear seat legroom, and the A8L an extra 13 centimetres). Very few owners are going to be seriously concerned about its ultimate handling characteristics in extreme conditions. 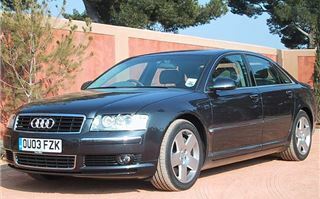 To them I’m pleased to say it doesn’t matter whether you set the suspension on Comfort, Automatic or Dynamic, the ride quality is always excellent especially for chauffeured rear seat passengers. As an adman once wrote of something else many years ago, “it stops the FT index going up and down”. Last, but far from least, we tried a 3.7 non-Sport. While it doesn’t have the grunt of the 4.2, if you use the DSG paddleshifts it will yowl its way up to 135 or so no bother at all. And it’s extremely stable at those sorts of speeds. It also handled far better than the previous day’s 4.2 non-Sport, with well-contained understeer and a tidy, predictable front end. 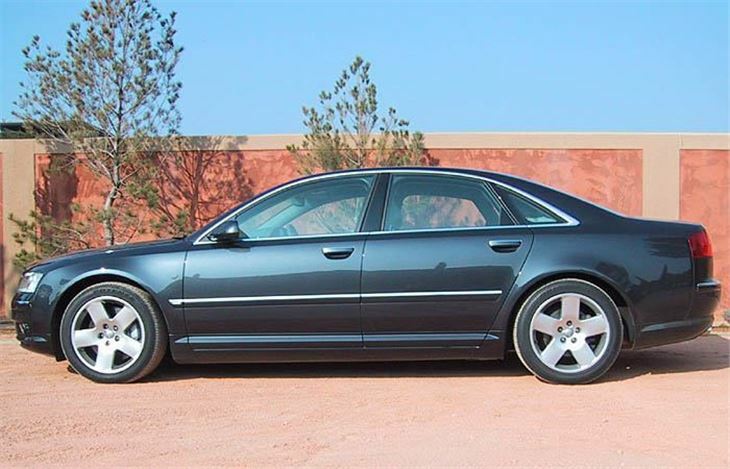 A very nice car, but if you’ve got the money, still go for the 4.2 Sport. After this we could only conclude that something had been wrong with the first car we drove. Could have been tyre pressures, which would have been easily fixed. Could have been tyre compounds. More seriously, could have been a geometry misalignment. But the most likely culprit was tyre pressure. Audi Sebring and Le Mans driver Perry McCarthy admitted he had driven that same car a few days previously and thought it was a bit “off”. Before I wrap up, there are a few more things prospective buyers need to know. There will be a 4.0 litre V8 TDI with 274PS and 650Nm torque from 1st June. 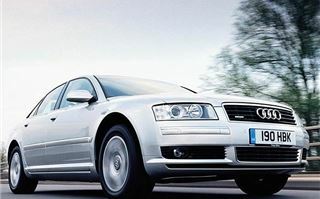 Audi is offering a 5 year / 75,000 mile service and maintenance package for a very reasonable extra £500, which includes Audi (not RAC or AA or something else) roadside assistance. The new aluminium spaceframe and panels not only provide a 60% more rigid structure than before, they are easy to repair; easier even than a steel monocoque because new sections can be inserted like a jigsaw puzzle and aluminium panels are actually cheaper than competitors steel panels. 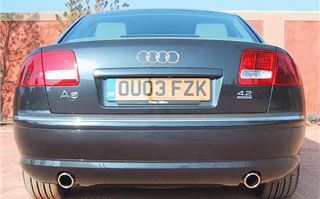 If you need to stretch your legs in the back, deliveries of the 130mm longer A8L will start on 1st October 2003, and of the W12 6.0 Quattro A8L on 1st December. And that’s about it. A great car. And a strong competitor to the Mercedes S Class, never mind the 7 Series and the new XJ8.